was born in Miami and grew up fishing Biscayne Bay when he was 2 years old with his mom and dad. He owes his determination and love for fishing to his mom who could fish from daylight to dark and go back the next day to do it all over again. “I have fished all over Florida, from Key West to Pensacola for fresh and saltwater species. My whole family including my mom, dad, aunts, uncles and cousins have fished for decades in Florida and throughout the Southeast”. His Florida fishing experience has been strong ever since those early years. Captain Tom still has his first tackle box, a wooden one, given to him by his uncle. It was hand made in Miami over 50 years ago. Capt. Tom has been featured in several local newspaper articles as well as in Florida Sportsman magazine. He was featured in the December 2002 issue about the great grouper fishing in the north Florida area and again in the September issue of 2003 with an article on fishing for king fish. He was on the cover of the Florida Sportsman magazine’s Feb.2004 issue. His latest accomplishment was he was featured on Florida Sportsman Television in a show on how to troll for grouper in Tampa Bay. This show was filmed in Feb. 2006 and was aired in June 2006. 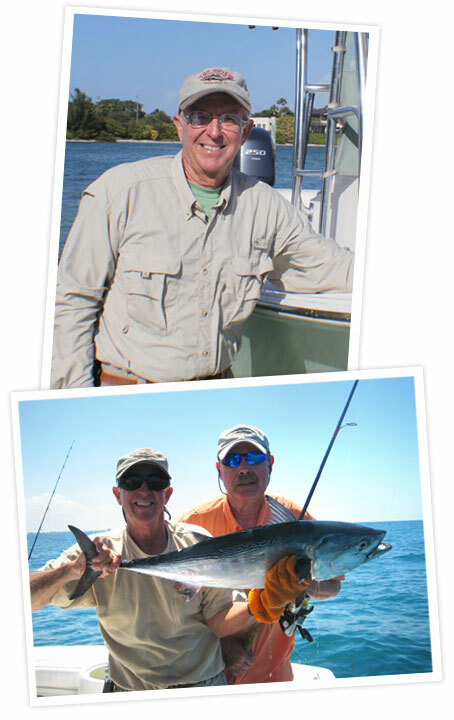 His fishing experience has overflowed to his son, Captain Tom Jr., who is the founder of Top Notch Sportfishing. Now they have combined forces and are members of the Top Notch Fishing Team. “When you fish with Captain Tom you not only benefit from his 50+ years experience but also another 50-100 years of experience he has gained from his family. He will do his best to put you on the fish and make your experience one you won’t forget. Having fun is what it is all about and hopefully is why you will book a trip. ” Come visit the west central gulf coast and let me show you some fun and teach you how the fishing is done in our area. Bring the kids cause there is always something biting and they will have a blast. See you soon”.